A Gold Doubloon to Spier of the Lavander Crab! 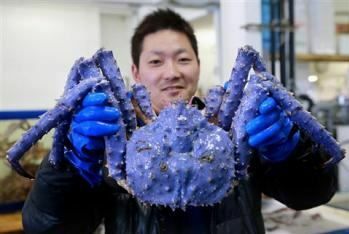 In a recent shipment of crabs from Russia, a Japanese seafood market found a surprise: a purple crab! Scientists speculate the vibrantly colored crustacean either has a mutated gene coding for pigmentation or had an unusually purple diet. Fortunately the President of the company has decided to keep the crab alive in a tank at their store. A new mascot, perhaps?